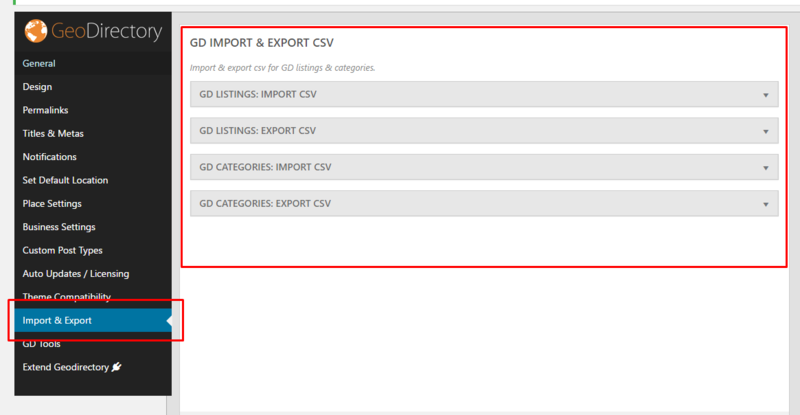 The Import & Export page allows you to upload listings or categories via a CSV file. You can also download your listings. Important things to know ! CSV files should only be edited with OpenOffice or LibreOffice Calc. This is because Microsoft Excel has auto-formatting built in which can not be disabled; we have seen many cases where this leads to broken phone numbers, addresses and 90% of the time wrong GPS information. Do not change the order or the names of the columns of the CSV files. Do not delete any columns. Categories may not contain commas. Categories with commas will make your import fail. You may import any UTF-8 characters from any language, but your spreadsheet must be UTF-8. If your CSV is not UTF-8 it will probably fail, so, save CSV as UTF-8. The Import CSV section allows you to upload listings via a CSV file. You also can download a sample CSV file to get you started. The first column in the CSV file is for the post_id. This field should be left blank, unless you want to update (overwrite) a listing. You can get the post_id of existing listings by exporting your GD listings. Do NOT add a post_id when importing new listings; WP needs to create its own post_id to avoid database conflicts. Your CSV listings file needs to have data for all mandatory fields for the listings you want to upload. this category has to be created for the post_type before you import! post_type: for example gd_place or gd_event; this CPT has to be created in WP admin before you import! Keep reading for mandatory fields for gd_event post types. The following fields (also mandatory) all relate to the location of your listings. Note 1: If you are using the Custom Post Type addon and have disabled the requirement to use a physical location for a CPT, then you can leave these fields blank. Note 2: We strongly suggest to add a few listings from the frontend, and then export those listings first. That will show you the type and format of the data required to be imported. Also, review the location notes if you have not done so already. If you want to add locations outside your default location, you will need to install the MultiLocations addon before you can import your data. The following fields (also mandatory) all relate to the date and time of your events. event_date: This is the first date of the event – use this format 19/07/2015 even if the display of your dates is set different in your WP admin. event_enddate: Must be completed unless the event is recurring. For recurring events, we suggest you add at least one using the frontend or backend of your site, and then export the CSV file do review the requirements for the various fields. post_author: Enter the ID of the user you want to assign the listing to. If left blank, then the post will be assigned to the user with ID 1, usually the administrator. post_status: Enter either publish or draft. If left blank, then the listing will be set to draft. You can add additional columns if you want to add more images to your listings, they all should be named IMAGE. You only need to add the filename of the image, for example photo.jpg. The extension should be in lowercase, ie: .jpg, not .JPG. Uppercase file extensions will result in the image not being recognized when viewed in the site. The filename of the image will be used for the title attribute of the image, for example My_Photo.jpg will give a title attribute of My_Photo. The optimum image size is 800 x 600 pixels. Make sure your WordPress settings are set as follows: Settings > Media > Organise my uploads into month- and year-based folders, and Save changes > Yes. It is possible that your category counts in the popular category or the CPT categories widget needs fixing after importing new listings. To do that go to GD > GD Tools and run Location category counts. Exporting your listings gives you the opportunity to edit listings and re-upload them. Exporting is also very handy after you have created extra custom fields or categories; just create one finished listing with the custom fields etc, and then export to get your very own sample CSV you can then use to upload your other listings. You can import your categories and subcategories using a CSV file instead of adding your categories one by one from the admin area. Download the sample file to check out the required structure and data. Do NOT add a cat_id when importing new categories; WP needs to create its own cat_id to avoid database conflicts. Your CSV categories file needs to have data for all mandatory fields for the categories you want to upload. cat_posttype: for example gd_place or gd_event; this CPT has to be created in WP admin before you import! Exporting your categories gives you the opportunity to edit them and re-upload them. Check the following import option: Update listing if post with post_id already exists. This will move all the listings from the gd_place table into the new CPT table, changing the categories. The Find Latitude and Longitude website is currently offline while they are changing their site from a free tool to a paid version. Go the the batch code page at the Find Latitude and Longitude website. The easiest is to add the addresses to the CSV file first, and then copy and paste into the input field. 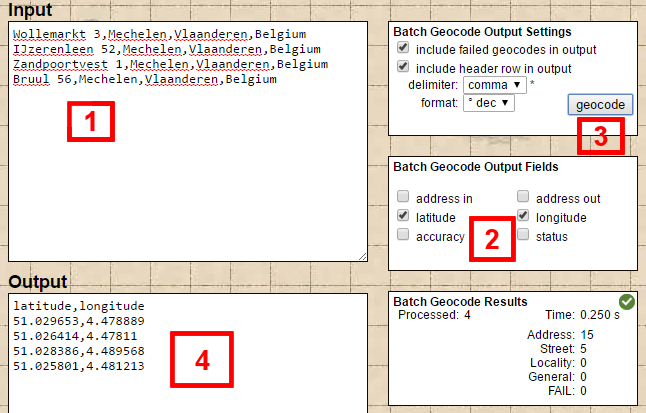 Step 3: Click the Geocode button in the Batch Geocode Settings box. Step 4: Copy the list that appeared in the output field with all the lat and long coordinates and paste it directly into your CSV file. geocodio: convert US and Canadian street addresses only into map coordinates and vice versa. If, after reading the document above, the import is still encountering errors, you can enable debugging in WordPress so that the import will create error logs that will contain more details about the issues with the import. Review the WordPress error log. Address problems with the import file.